The Pegasus Population Health & Community Engagement Team contributed to this year’s Positive Ageing Expo held on the first of October at Papanui High School. 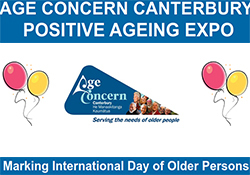 The event was successfully organized by Age Concern NZ. The Positive Ageing Expo was well attended with over 2,500 people visiting the variety of stalls and exhibits from the participating organisations and service providers. 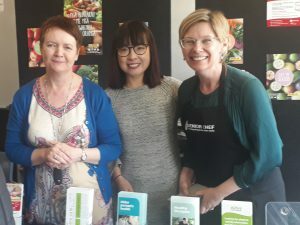 The Pegasus Healthy Lifestyles Team promoted both Appetite for Life and Senior Chef programmes, with 22 new people enrolled into the Appetite for Life and 33 into Senior Chef programmes for 2019.
Pegasus staff – from left: Jane Callahan, Edith Yi and Wendy Scanlon. The Partnership Community Workers engaged with people around their enrolment with a primary health care organisation and the benefits of receiving support from their local general practice. Everyone enjoyed Val of Vee Jay’s music – many attending were up dancing! Arvida Group Choir also provided entertainment and Zumba Gold really got the crowd moving, with students from Papanui High School, Canterbury Police and other attendees moving to the beat. A big thank you to Pegasus for their contribution to making the Positive Aging Expo another successful event for Cantabrians to enjoy! Previous Previous post: 1737 – Need to Talk?